Tillie Shafer was born to wealthy California parents who indulged his whim for sports, and he jumped from college to college competing in baseball, track, and rowing. In contrast, from the moment he joined the New York Giants, the shy, good-looking lad from an affluent family was harassed by the hard-nosed veterans, some from the rough-and-tumble old Orioles. Combine this with a lack of playing time and a yearning to be back on the West Coast, and Shafer was continually discontented during his days on a major-league diamond. He left baseball for good at the age of 24 after four unhappy seasons with the Giants. Though his major-league career was ordinary, Shafer does have one distinction: In the off-season between the 1910 and 1911 seasons, he sailed to Japan to train ballplayers at Keio University; he was the first active major leaguer to do so. Keio produced a training manual from his instructions that it used for decades, recognizing it as John McGraw's methods filtered through Shafer. After he quit the game, he had the family businesses to tend to and devoted himself to amateur golf, collecting titles throughout the country into the 1930s. Arthur Joseph Shafer was born on March 22, 1889, in Los Angeles, and grew up in the well-to-do Lake Park District. He was the oldest of four children of Frank and Alice (Keller) Shafer, California natives who were married in 1887. Frank ran lucrative real estate and later automotive agencies. Shafer grew up interested in sports and studies. He attended the high school division of St. Vincent's College, a Catholic school in Los Angeles now known as Loyola Marymount University. Though only in high school, he played second base for the college squad beginning at the age of 15 in 1904. Future major leaguer Fred Snodgrass, a catcher at the time, was a teammate in 1906. After St. Vincent's, Shafer enrolled at Notre Dame University in Indiana. He tried out for the football team, but quit after taking a hard hit in his first scrimmage. He competed as a sprinter and broad jumper on the track team. But he was unhappy at Notre Dame and before long transferred to Santa Clara College in Santa Clara, California, about 45 miles south of San Francisco. Santa Clara was a baseball powerhouse, and Shafer spent three years there. Besides his baseball exploits, in college Shafer collected numerous medals and trophies in the 100-yard and 220-yard dashes and in the broad jump. He was extremely fast and was once timed by the New York Giants at 3.2 seconds from home plate to first base. In the summer of 1908, Shafer traveled to Hawaii with the Santa Clara baseball team. That year, he had been offered a contract by Connie Mack to join the Philadelphia Athletics; however, his parents preferred that he pursue more serious endeavors. Shafer stayed at Santa Clara and continued to compete in sports until he left school in 1908. Throughout and after his four-year major-league career, he attended other colleges from time to time. Shafer was recommended to the Giants by his former teammate Fred Snodgrass, who had stayed at St. Vincent's through college. In March 1907 the college team played the Giants several times in exhibition games during spring training in Los Angeles. Manager John McGraw was impressed by Snodgrass's play and his aggressiveness, including arguments with the umpire -- who that day was McGraw himself. After the season, McGraw, while visiting Los Angeles, signed Snodgrass to a contract. The new recruit joined the Giants in June 1908, after the school year ended. At Snodgrass's recommendation, the Giants signed Shafer for the 1909 season. Shafer left Santa Clara College over his father's objections and joined the Giants for spring training at Marlin Springs, Texas, in February. Shafer was a 5-foot-10, 165-pound, switch-hitting utility infielder with lightning speed, a strong throwing arm, and a good batting eye. Shafer was hassled from the moment he first entered the Giants' clubhouse. He was a young, good-looking, shy guy from a wealthy family unaccustomed to hardened East Coast athletes. He didn't drink, smoke, or chase women -- the typical ballplayer activities of the time. Giants star outfielder Cy Seymour quickly bestowed the feminine nickname Tillie on Shafer. Throughout his tenure in New York, Shafer was branded as a momma's boy and razzed by his teammates accordingly. Shafer was very sensitive to the barbs, continually complaining and whining about quitting the team. It was said that McGraw was the only thing standing between him and continued abuse. He appeared in 38 games for the club that first year, batting .179 in 84 at-bats. Over the winter, he played for Pasadena in the California Winter League. In 1910, Shafer played in only 29 games and batted .190. Tired of warming the bench and hearing his family's gripes about his chosen profession, he looked for other opportunities. Still, after the season, he signed to play again for the Giants in 1911. Meanwhile, in December 1910, he sailed to Japan to instruct the Keio University baseball team, which he had faced in Hawaii. Keio was planning a U.S. tour in 1911 and wanted to gain as much seasoning as possible. Shafer and a boyhood friend, Fuller Thompson, arrived in Yokohama on December 24. After a brief stay in chilly Tokyo, the site of Keio's home campus, they traveled 500 miles south to Kobe, where they worked with the Japanese collegians from December 27 to January 18, 1911. Afterward, Keio produced a book of the Americans' instructions titled The Art of Keio Baseball. It was passed down through generations as the methods of John McGraw taught through Shafer and Thompson. Shafer arrived back in California in mid-February, and discovered that on January 20 McGraw had traded him to the Boston Braves for second baseman Dave Shean, but that the deal, which McGraw made with Boston manager Fred Tenney, had been vetoed by Braves president William Hepburn Russell. Angry over the events, Shafer decided to quit the Giants and enrolled at Stanford University in Palo Alto, California, to study agriculture. He stayed away from the Giants for the entire season, and was officially suspended. Shafer decided to rejoin the Giants in February 1912 for spring training. The National Commission, the major leagues' governing body, reinstated him without penalty, since he hadn't played in an outlaw league in 1911. Shafer appeared in 78 games for the Giants in 1912 and batted .288. On May 3, he was involved in a rare triple steal in a game against the Philadelphia Phillies. With two outs in the ninth, the Giants down by a run, and two strikes on the batter, the runner on third, Buck Herzog, stole home. Shafer landed at third base and Chief Meyers at second. The play tied the game, but Christy Mathewson gave up two runs in the tenth to lose 8-6. In the World Series against the Boston Red Sox, in which his buddy Fred Snodgrass was one of the goats, Shafer appeared in three games as a replacement fielder without a plate appearance. An incident in the clubhouse after the final game soured Shafer on his teammates and baseball in general. After Fred Snodgrass made his infamous "muff" that led to the Red Sox' victory in the final game, some Giants players vented their wrath on their center fielder in the clubhouse, complaining that he had cost them the $1,500 difference between the winning and losing World Series shares. As the taunts became particularly vile, Shafer jumped to Snodgrass's defense and engaged in numerous heated confrontations. In December, Shafer told a reporter in Los Angeles that he was through with baseball. The reporter quoted Shafer as saying in effect that he was quitting because he received "way too many perfumed notes." This gave the public the impression that Shafer quit baseball because he was being harassed by women. But the real reason was Shafer's anger over the Snodgrass incident as well as the fact that his mother had recently died. Shafer inherited cash, real estate holdings, and business ventures. His father was pressuring him to stay in Los Angeles and run the family's automobile company as well as tend to other holdings. After a great deal of prodding, the Giants finally coaxed Shafer to spring training in Texas. On March 5, 1913, he even signed a three-year deal calling for $7,500 a season. He turned in a fine year for the Giants in his only full-time major league season. In a utility role (79 games at third base, 25 at second, 16 at shortstop, and 15 in the outfield), Shafer batted a respectable .287 with 52 RBIs. In the World Series against the Philadelphia Athletics, he started in all five games, batting .158 in 19 at-bats, scoring twice, and knocking in a run. Once again Shafer announced his retirement, on December 16, 1913. This one stuck. He told McGraw of his decision when the manager stopped in Los Angeles during the 1913-14 world exhibition tour by the Giants and the Chicago White Sox. Shafer offered many reasons for his departure. First, he was going to work managing his father's holdings. He also didn't like the baseball life, stating, "While playing with the Giants in New York, I aged ten years and my hair is turning gray." He further didn't care for the East Coast in general. And finally, he was miffed that McGraw had him play 15 games in center field, Snodgrass's position, relegating his best friend to the bench. Shafer summed up his feelings: "I have satisfied every ambition in a baseball way. Now I want to forget I was ever in it. It is an episode in my life that I am trying hard to forget. I have plenty of money and I'm not dependent upon the $7,500 a year from the Giants." McGraw considered Shafer one of the best utility players he'd ever seen. The Giants didn't officially release Shafer until 1926. In 1914, Los Angeles of the Pacific Coast League asked the Giants to release Shafer so he could play third base for the Angels. The Giants refused. 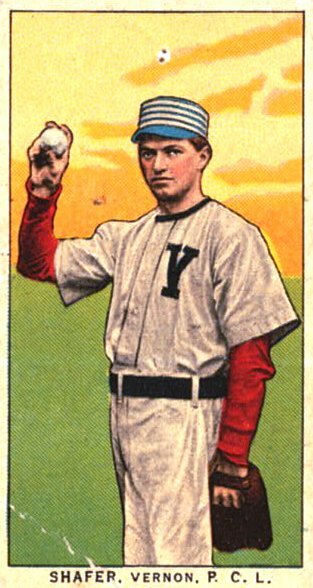 McGraw repeatedly tried to coax Shafer to camp, contacting him every year through at least 1919 and offering him the third baseman's job. Shafer almost accepted in 1917. In 1914 Shafer played in some exhibition games for Stanford, and he played in amateur contests into the 1930s. In November 1914, Charles Weeghman, president of the Federal League's Chicago Whales, contacted Shafer, to no avail. The Los Angeles Angels offered Shafer the position of player-manager in 1915, but he was truly done with organized baseball. In 1915 Shafer developed a serious interest in golf. In July, he won a tournament at his Los Angeles country club, and then was reinstated as an amateur by the U.S. Golf Association. He was granted amateur status since he had quit baseball. He won several tournaments in the fall of 1915 and registered an official handicap of 6. By the 1920s, he was shooting par golf or better and was a serious contender at local tournaments throughout the decade and into the 1930s. Shafer married Californian Gwendolyn W. Shafer in 1917. They had four children, Mary, Suzanne, Barbara, and Arthur W. In August 1917, with the United States now in World War I, Shafer enlisted in the Navy and joined the reserve officers training program. In March 1918 he was assigned to the naval training station in San Diego. There, he was named captain of the baseball team. In November 1918, when the war ended, Shafer was learning to fly a seaplane. He was released from the Navy at the end of the year from the University of Washington Naval Training Station. Throughout his post-baseball life, Shafer was financially well off. Professionally, he administered a real estate agency, an automotive agency, a large fruit distributorship, and a menswear store. His haberdashery was popularly noted in Los Angeles for catering to celebrities during the 1930s. But he expressed some misgivings over leaving baseball so early. Shafer told Baseball Magazine in 1933 that he regretted walking away from the game. "I shouldn't have broken and run that way," he told the magazine. "I've been sorry ever since." At the age of 72, Shafer died on January 10, 1962, at his home in Los Angeles after a long illness. He is buried at Holy Cross Cemetery in Culver City, California.